My son recently discovered Sudoku and I recently discovered MicroView. 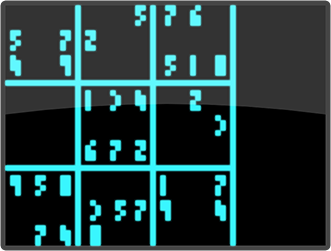 So, I decided to make a Sudoku puzzle solver using the little screen. I wanted the MicroView screen to show a real-time view of the puzzle as it is being solved. No font was small enough, though! I needed a reasonably legible number font that could fit 9 digits vertically. I was able to make a 2x4 font that did the job (but there's no zero (looks like an equals sign) and the 8 and 3 are a little obscure). For Sudoku, this worked great! It's not perfection I'm seeking but always a job well done. Enjoy doing fun stuff while you can because we all need a healthy balance, to combat all the necessary serious stuff.